Noone Likes A Drafty Attic! If you have had recent problems with rodents in your attic, removing them is only half the job. Depending on the kind of pests that found their way inside, you will need to have the entire attic decontaminated to remove any pathogens, as well as urine and feces. Our expert team can remove any bio hazardous waste from your attic and then have the area disinfected entirely by using deodorizers, pesticides, and disinfectants. 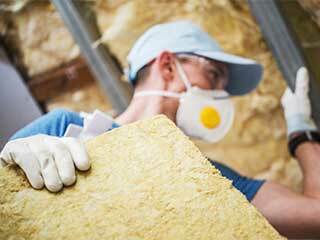 Moreover, we can also help with the reinstallation of new insulation after the removal of the contaminated one. Air sealing is a quick way to stop the attic from being the most significant source of energy loss in your home. By installing insulation and sealing any air leaks at the same time, you can make a big difference in the level of comfort and energy bills as well. Even though you may not think of it too much, this is a critical step when it comes to the installation of an attic because it can reduce your heating and cooling bills significantly while also preventing attic mold. At Attic Cleaning Simi Valley, CA we specialize in cleaning crawl spaces, so if you have noticed musty or moldy odors in your home, or you have concerns about flooding, our experienced team is here to help you. We specialize in solving all types of crawl space issues, which often arise because many homeowners don't access this space regularly. By cleaning this area on a regular basis, you will be able to eliminate a significant source of allergens in your home and create a healthier living environment. This is particularly important if you or a member of your family suffers from allergies. Leave it to the experts by calling Attic Cleaning Simi Valley for all your attic insulation needs. Our company stands for quality, professional service and reputation. Our qualified attic cleaning team can provide you with the right advice, materials and a wide range of services that you need to make sure your attic is in peak condition to protect everything that’s underneath. Read more on our website or give us a call anytime! If you have any queries, don't hesitate to leave your contact information below. We are happy to answer any and all questions you may have! Your satisfaction is our highest priority, and we will try our best to accommodate any problems or requests you may have. Thank you for scheduling with Attic Cleaning Simi Valley! Feel free to browse our website for more information until we meet!